There are so many ways you can bring your community in on your classroom process. One way is through an informance. An informance could be as simple as inviting parents to watch a class - simply set up some chairs in your room and you’re ready! Alternatively, it might be something more polished and set on a stage. Whatever your choice, remember that an informance is meant to be process based, not product based. The goal is to educate the audience on what students are learning in your classroom. If you haven’t already, click through to this post on getting started with informances. Today’s post will cover some questions I’ve received about informance logistics. We’ll look at parent communication, choosing material, rehearsals, and setting up the stage. Let’s jump in! I look for movement words or movement images. 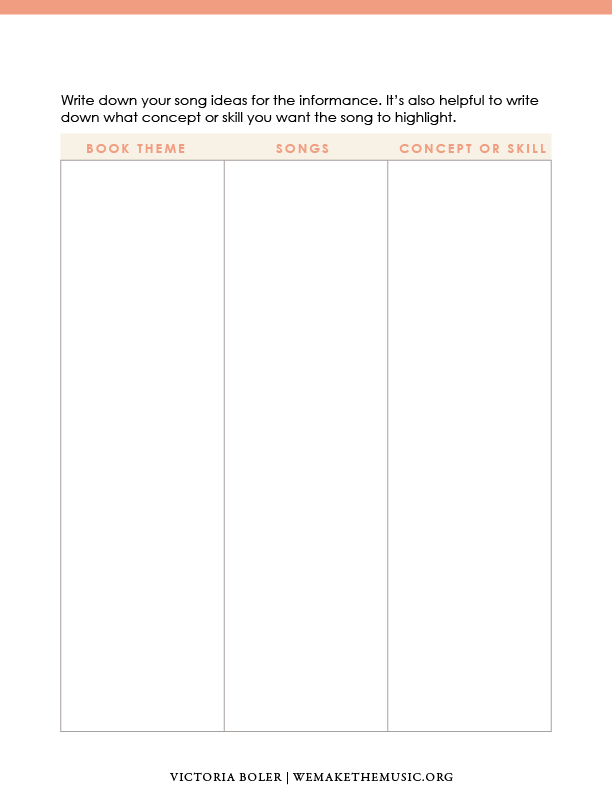 I look for themes that can connect to musically and developmentally appropriate folk songs. I look for text ideas that could be rhythmically broken up into rhythmic building blocks. The key is to find things that tie into what you’re doing already, and to connect the informance material back to your curriculum. If I get an idea that doesn’t connect to a concept I know I want to teach in that semester, that song is not included in the informace. If a page doesn’t seem to have anything I can musically connect back to, I leave it blank. I may come back to it a day or two later, but if an idea doesn’t come to me the page simply won’t have a song. It’s actually helpful to have some pages without songs to use as transitions in the show. These are pages where students will be moving to different instruments, or walking on or off stage. With my book and my songs picked out, it’s pretty much “business as usual” in the music room. However, as I build my classroom activities I think through how it could be transferred to a stage, and how easy the activity would be to explain to a parent. A document like this Informance Planning Sheet can be helpful as you think through what concepts and skills you want to highlight. Click on the informance planning sheet to download it for free! I always include several different modes of parent communication, including physical notes home, emails, and flyers at the front desk. Here are some examples of flyers I’ve sent home in the past. On the back of the flyer, I always include a brief explanation on what an informance is, since it’s likely parents are not as familiar with the concept. I send home two invitations: One is about two months before the event, and another about two or three weeks before the event. Making it work: I use Adobe Illustrator to put together these notes for home. However, there’s also a free program called Canva that some great templates ready to go! In addition to the flyer, I also send an email around two months before the production. Email is one of my primary ways to communicate with parents, so it happens more frequently as we get closer to the informance date. How do parents in your school receive information about events on your campus? My school has school-wide newsletter, monthly class newsletters, and a place to promote events at the front desk. I use all of these to get the word out. What have you learned about in music this year? What is your favorite thing about music class? Students also included the date and time of the informance in their invitation. It was so simple, but it was nice for some of the communication to not be coming from the student instead of me. Having students in small groups saved on the number of ipads we needed for this activity, which saved on the transition time of students logging in, submitting the video, and getting ipads out and put back away. If you only have one ipad, you can either have student groups go into the hallway one at a time to film their invitation, or the class can vote on what they want to invitation to say and you can film the whole class at once. Filming the class all at once would work if you don’t have a school ipad at all, but you do have a school computer with a camera or a smartphone. In my last post I said that an informance can be as easy as inviting parents to your room during music class. That can be a very effective way of programming an informance! However, for a variety of reasons I chose to show my informances on a stage. One reason was that instead of doing a program for every single grade, I believed I could simplify my spring semester by combining grade levels. This created logistical problems with my classroom as a staging area, as my audience size would be too large to fit in the room. Instead, we move the program to the stage and I set up the stage to look like my classroom layout as much as possible. I put the instruments on one side, I tape down a circle so we can play games, and I bring in choir risers so we can see students sing. The final result is a good representation of my music room, and the stage has spaces for singing, playing, speaking, and moving. If you don’t have access to a stage, this set up could work just as well in a gym or cafeteria. I always like to have three rehearsals, plus a dress rehearsal. I only do informances with TK - 3rd grade students, so these rehearsal times are very important with these grades! It includes the riser order for students, the script, and highlighted directions for teachers so they can help students move where they need to be. All the classroom teachers come to the rehearsals with their students. They are responsible for bringing kids on stage, helping them transition to other stage locations, and leading students off stage. At the informance itself the teachers stand on stage with the students. * Note: Even though our production is on a stage, it’s not really a formal event. I tell students beforehand that they’re allowed to make mistakes! If they go to the wrong spot (remember these are young students), the teacher is there on stage to help them. One of the most special parts of the program is that my principal reads the book. Out of respect for her time, she only shows up for the dress rehearsal but she and I meet beforehand to go over the program order and any special logistics. Make sure my activities are realistic. While we do show some polished pieces, we also show some things that aren’t quiet as “stage ready” as I’d like them to be. This program showcases learning. I keep the same games we do in the classroom as well, which means that it’s possible parents will watch their child get “out” at the production. I don’t change the game to make sure everyone stays in, or everyone gets a turn. I try to keep it as true to the classroom as possible. Before the program I talk a bit about what parents are about to see. I highlight things like progress and growth. I tell parents to watch for mistakes and how their students recover from those mistakes. I share briefly about the instruments we use and why we use them, and any part-work skills they’ll see. I also point out that all the music in the program is student - arranged, since through the Orff approach students have so much choice in how the pieces turn out. My personal preference is to talk as little as possible so I keep this part short! I always print a program that gives parents one thing to watch or listen for. Here is an example from a TK - 1st Grade informance. Slides for each song either include what to watch / listen for (same as the program), or they’ll highlight the national music standard the song addresses. In addition to these things at the informance itself, I also rely on the Seesaw app to show parents what we’re learning. For me, this is an important piece that gives more of a context for the program. Using that same material from Seesaw, I can put a picture of the class doing an activity on the walls in the hallways or front lobby. Next to the picture is a QR code parents can scan. This QR code leads to a video of students singing, playing instruments, moving, or doing a game. This is the same footage from Seesaw, but I’m repurposing it to show more parents the fun we have in class. These images and videos can lead down the hallway to the auditorium as parents walk in. Informances are a playful way to educate your parent community about the work your students do! They are also a great advocacy tool. This was my personal process, but each teaching situation is unique! There is flexibility to put on a production that perfectly showcases your unique teaching style and your individual student groups. If you have any questions about informances I’d love to hear from you. Drop a comment below and I’ll look forward to reading it.